I am always burning candles at home. I love the ambiance it brings as well as the fragrance. I find I am always drawn to food scents especially all the sweet stuff! 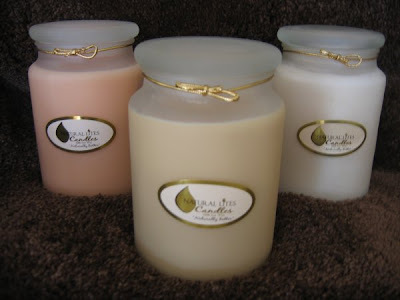 When I had the opportunity to review one of Natural Lites Candles products, I jumped at the chance! Natural Lites Candles are the makers of all-natural, non toxic, 100% soy wax candles and their candles are considered one of the best soy candles out there on the market. Each of their candles is hand poured and ultra scented and made using only 100% US grown soybeans. This was my first time using a soy candle and I have to tell you I am now addicted to them! These candles have NO black soot!! I always hated when I burned my other candles at home that the jar would be black and it just looked so nasty. Since Natural Lites Candles are made with soy wax and NOT paraffin wax which actually contains petroleum, they DO NOT emit carcinogenic toxins in the air. They also use 100% soy not a soy/paraffin blend like some other soy candles on the market. 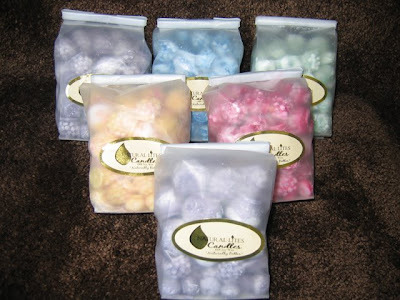 Plus their wicks are lead-free and all their candle dyes are free of hazardous solvents and additives. Another benefit of Natural Lites Candles is that they are eco-friendly and soy wax is biodegradable. Even if you happen to spill candle wax (which I have done in the past- not fun), you only need clean it up with soap and water since soy is water soluble! I remember a few years ago ruining my carpet when I spilled a candle and could not get it out! Plus every time you purchase a Natural Lites Candle you are helping to support US farmers. I know many of you would rather buy products made locally than from some unknown factory in China. I know I would too. Natural Lites Candles actually burn up to 50% longer than other candles which saves you money. Plus when you burn one of these candles , it burns completely to the end and does not leave any leftover wax remaining in the jar. These candles are also lower prices per ounce than most soy candles on the market. 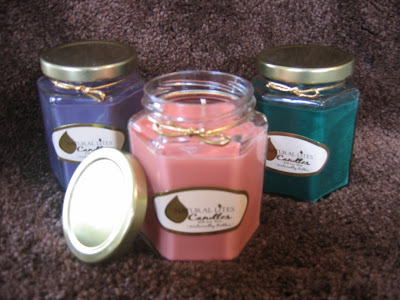 Natural Lites Candles has a very impressive selection of candles and scents. They have Bakery Scents (ie. Pumpkin Cheesecake), Fresh, Floral & Woodsy Scents (ie. Lavender Mist), Fruity Scents (ie. Papaya Nectar) and Spa Scents (ie. Romance). My favourites are definitely the Bakery Scents and they all sound just heavenly!! I got to try out the Butter Pecan Hexagonal Jar Candle. It’s a 9 oz single-wicked candle in a clear glass jar with a gold lid. This is a new scent that Natural Lites Candles is introducing this summer. And let me tell you, its AMAZING!!! This candles smells incredible! I couldn’t get over how awesome my house smelled when this candle burns. It really permeated my whole main floor of my home and my house smell like I was baking some incredible dessert. With previous candles I have used, they never made my home smell this good. Plus there was no black soot! I remember trying to light some other jar candles and coming out with a black hand from all the disgusting soot on the side of the jar. There was NO black soot whatsoever! Now that I have tried one of Natural Lites Candles, I don’t want to have to go back to my other ones. This is my new favourite! I appreciate that it is all natural and non toxic which seems to be the direction my family is taking these days. The prices are awesome too. The 9oz jar candle I received is $12.99 which I would definitely buy again. Highly recommended! To purchase Natural Lites Candles, please visit their website.